As published on page 14 of August’s North Norfolk Post. You may find yourself taking the lead in a group; others know that you’ve got what it takes to get everyone working together. Laying out clear ground rules and staying focused on the task in hand should get the job done. Relationships look to be in focus and you may benefit from a conversation with someone close. They could be quite reluctant to open up, but a heart to heart chat should be revealing and productive; just don’t push too hard! There will be plenty to discuss on the home front this month. Just remember to give all involved a chance to air their opinions. There are bound to be some good ideas arising from this and your logical, objective approach will help when drawing up workable plans. Money matters look to be in the spotlight; going through your finances thoroughly will give you a clear picture and help you to decide upon your priorities. When it comes to joint ventures and investments get your facts straight and then trust your instincts, they won’t let you down. You may clash with a certain person and investing too much energy into this can be wearing. Things should come to a head around the full moon on the 25th. Taking courageous action will help you to leave past difficulties behind. Have you been keeping something close to your chest? If so, a new moon in your sign on the 9th will give you the green light to say what you need to. Sticking to the facts will help you to keep things in perspective and get your point across clearly and calmly. Don’t forget to nurture your creative side, you may have to juggle your commitments to find the time, but it will be well worth it. So get out those paints or that knitting which has been lurking in the cupboard and give it your full attention. This could be just what the doctor ordered! Friends are encouraging you to shake it up. You may find that a new person joins your social circle or existing friends encourage you to try something new and exciting. Look out for an invitation to go beyond your comfort zone and have some fun. You could be feeling quite introverted, so set some time aside just for you and do whatever you feel like doing. This should help you to recharge your batteries. You may also discover a hidden talent which you prefer to keep secret, at least for the time being. Have you been feeling stuck lately? From the 6th of September obstacles should start to fall away, allowing you to move forward with ease and reap the benefits of your efforts. Family issues may arise around the 17th so use your wisdom to bring practical solutions to any problems. Your energy levels look to rise, giving you the oomph needed to finish a long standing project. At the end of the month, you may need to make a decision about what you really value. Weigh up the options and then go for it, others can offer advice, but in the end it’s up to you. An opportunity which would benefit your long term career prospects is beckoning. Investigate the possibilities thoroughly and run your ideas past a trusted person. This should help you to see the bigger picture. If you would like to know more, why not contact me (Claire) for a personalised reading? On Saturday 11th August there is another eclipse coming up – eclipses usually come in pairs – one solar and one lunar and occasionally, there is a third. This eclipse season started with the solar eclipse on 13th July, then the lunar eclipse on 27th July (for those lucky enough to see it) and now a second solar eclipse. It is a partial eclipse, so the sun won’t be totally covered. It is visible in Northern and Eastern Europe, Northern parts of USA and North West Asia. It goes too far North to be seen in the UK. Astrologically, this eclipse is in Leo and so is about our courage, our heart, our passion. Solar eclipses are about beginnings – (they occur on the new moon) and for every beginning there is always an ending. So the new is coming, but the old cannot be ignored and this is particularly true at the moment when six planets are retrograde (appearing to go backwards). These planets are; Mercury ( the mind and communication), Mars, (anger, assertiveness, action) Saturn, (restriction, reality, responsibility) Uranus ( revolution, sudden change, invention) Neptune (compassion, illusion, dissolution) Pluto, (deep and lasting transformation) Retrograde periods are times of examining and accepting the past. So the new beginnings will involve the past. Mercury the communicator is conjunct (close to) the sun and moon so new information may come to light bringing new ideas and possibilities. This course is running in Norwich for 8 weeks on Wednesday evenings from 3rd October to 21st November. It is at Norwich High School. So if you want to know more about astrology now is your chance! Do you know your Aries from your Pisces? Your ascendant from your planets? This fun, informative course is an introduction to astrology; no prior knowledge is needed. You will be introduced to the building blocks of the symbolic language of astrology: the signs of the zodiac and the planets. You will also be given the tools to pick out the major themes in birth charts. You will also be given a copy of your individual birth chart at the beginning of the course and will work through this relating the material back to your own birth chart and personality. The course will start with an overview of astrology including a brief history and an explanation of the different fields of astrology. Recognise a birth chart and look for the ascendant, the midheaven and the descendant. Identify and work with the 12 signs of the zodiac. Identify elements, qualities and aspects. Link the twelve mundane astrological houses to the signs of the zodiac. Identify and work with the 10 planets: their order, symbols and astrological meaning. Link the 12 signs of the zodiac to the 10 planets. Analyse the meanings of different birth chart shapes and aspect patterns. Use an astrological chart to find the position of the Sun and Moon. Recognise the importance of the relationship between the Sun and Moon within a birth chart. Pull this all together to give you the tools to begin to interpret a birth chart.Please note: I will need your time, date and place of birth after registration so I can draw up your birth chart. I am a Sagittarian and love to learn and teach. I have been interested in the art of astrology and have practised it for most of my adult life. 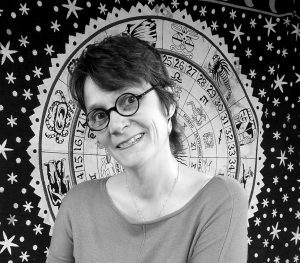 Being a graduate of the Mayo School of Astrology and a qualified teacher, I teach beginners’ astrology classes and workshops with a particular interest placed on the moon and her cycles. Long term goals appear to be in the spot light this month. You may have to review your plans and make some adjustments to achieve what you need to. By the end of the month any hold ups should start to fade away, leaving you free to proceed with certainty. You may have been caught up in lots of detail recently, but this month is a good time to step back and be objective about your responsibilities. Colleagues are likely to be in a co-operative mood and happy to help you out. This would give you the chance to relax and enjoy working with others. You have probably been bandying ideas around and discussing plans for a creative project. These may be quite fluid at the beginning of the month. However, around the solar eclipse on 11th August you should settle on a plan of action. A week later, your ruling planet Mercury begins to move forward, so go for what you want! Money issues could come to light around the solar eclipse on August 11th. You may need to decide on your priorities and once you have, speak up and make your position clear to others. Stand firm and do not be swayed, but remember that a little tact can go a long way to helping you get what you need. On August 11th there is a solar eclipse in your sign so a new phase is on its way for you. As with all things new, this will involve challenges, but a flexible and open minded approach should make things easier. Discussions should be very rewarding, listen to your friends, some of their interesting ideas may just give you the inspiration you need. At the beginning the month, make time to spoil yourself for a change. Some much needed pampering could really help you to recharge your batteries. Around the full moon on the 26th others can be a bit over emotional, offer tea and sympathy by all means, but don’t get caught up in the drama! You look to be popular this month as Venus, planet of love and attraction moves into Libra so all you have to do is wait for the fun to begin. When it comes to relationships, romance could be on the cards and for those of you already coupled up; partners may surprise you, in a good way! The solar eclipse on August 11th falls in your career zone suggesting positive new beginnings work wise. This will boost your confidence and open up creative opportunities for you. It is time to take stock and enjoy the rewards of all your efforts. A new opportunity to expand your horizons could appear around the solar eclipse on August 11th. You are likely to have the chance to express yourself and get yourself seen. A little self belief can go a long way; put your money where your mouth is and make the most of it! You should be more energetic than you have been recently. So this is a good time to tackle half finished projects that have been hanging around for a while. You may want to put a new twist on your original plans and will feel a sense of a job well done once they are completed. It looks like there may be changes on the domestic front for you and everything can feel quite up in the air. By the end of the month the way ahead should become clearer. Don’t push too hard, changes take time. If others are being difficult, try seeing things from their point of view, you may be surprised with the solutions they offer. Have your thoughts been drifting off to distant shores? Well, now is a good time to dust down your suitcase! Whether you are hoping to soak up a new culture or the sun, do what you do best; go with the flow. Getting away from it all will be fun and you are bound to discover something new and inspiring.